"Nevertheless he left not himself without witness, in that he did good, and gave us rain from heaven, and fruitful seasons, filling our hearts with food and gladness." Hiram Page was born in 1800, in the State of Vermont. All that I could find about his early days is that he was a medical student. He later became a physician and practiced in New York and Canada. At age 25, while living in Seneca, New York, he met the Whitmer Family. He married Catherine Whitmer on November 10, 1825. They would have nine children. While living with his wife at the Whitmer farm he met Joseph Smith, and would eventually become one of the eight witnesses of the gold plates. He was baptized when the church was officially organized. Along with being one of the witnesses, his other claim to fame was the story about him and a peep-stone. His claim to be receiving revelations for the church prompted the lord to reveal who does and doesn't receive revelations for the whole church. This is recorded as section 28 of the Doctrine and Covenants. Hiram repented and went on to be called on special preaching missions, held various church positions, and tried to use legal action to stop the persecution of the Mormons in Missouri. In 1838, the church was experiencing some of it's most turbulent times in Missouri. At the height of the mob violence, Hiram was severely beaten by a group of non-Mormon vigilantes on October 31, 1833. 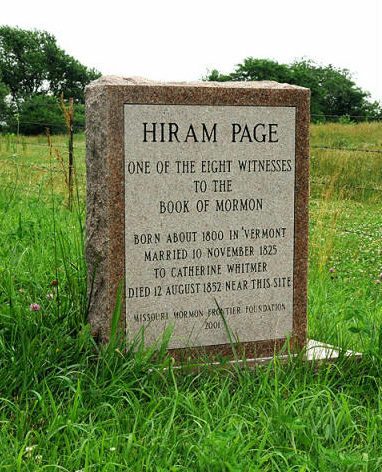 Not long after, Hiram Page took his family and voluntarily left the church. Partly because he reached his breaking point on persecution, and partly because two of his brothers-in-law were excommunicated. He relocated his family to Ray County, Missouri, where he lived out the rest of his life on a farm. He died on August 12, 1852. "I knew my father to be true and faithful to his testimony of the divinity of the Book of Mormon until the very last. Whenever he had an opportunity to bear his testimony to this effect, he would always do so, and seemed to rejoice exceedingly in having been privileged to see the plates and thus become one of the Eight Witnesses." This was over 30 years after his father's death. Philander was not affiliated with the church, and would have no reason to lie about his father's testimony. He could have easily said that he never rejoined the church because his father admitted it was all made up. Instead he reaffirms his father's knowledge that the Book of Mormon is divine and authentic, and that Hiram Page did in fact see, touch, and lift the plates.